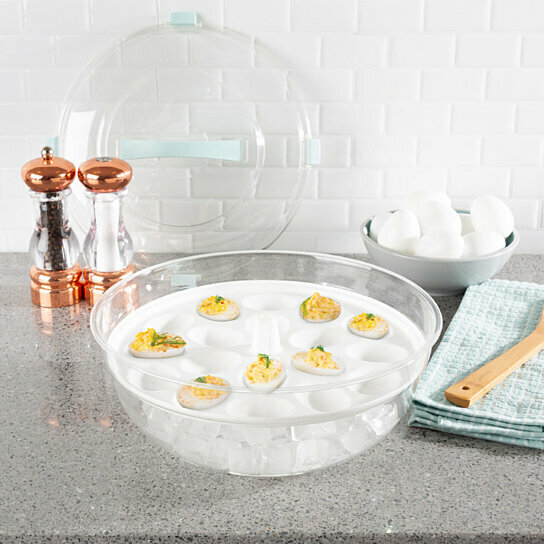 4-IN-1 SERVING TRAY- With a cooling bowl for ice or salad, a tray that holds 18 deviled eggs, and a platter with 3 compartments, you can easily keep fruit, veggies, cheese, meat, or any chilled appetizers at the perfect temperature during your event. PORTABLE CARRIER- This convenient serving set also comes with a secure locking lid, making the dish easily portable and travel-friendly; it’s perfect for keeping food fresh, safe and cold at a picnic or potluck. BPA-FREE AND STURDY- The cold serving tray is shatter-resistant and BPA-free, making it a safe and long-lasting option to use for parties and events for years to come. The container is also refrigerator and top rack dishwasher safe. INDOOR OR OUTDOOR USE- Great for both indoors or outdoors, this stylish and practical serving dish is a must have for your next barbecue, baby shower, graduation, or birthday party! PRODUCT DETAILS- Material: Plastic. Dimensions: (L)12" (W)12" (H)5.5 Certified FDA food safe and top rack dishwasher safe. Wash before first use. 4-piece set comes with bowl, egg tray, divided tray, and lid.